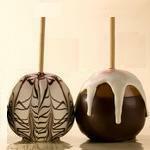 Delight your guests with delicious double dipped "White Chocolate Bridal Caramel Apples" smothered with Coconut Flakes. Send your friends and family home with something they will never forget! 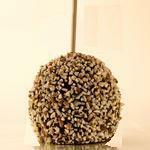 Minimum 50 Apples - $4.00 per Apple. Minimum 50 Apples - $5.00 per Apple. Choice of 3 toppings listed below per Apple. Minimum of 5 per combination. Bags, metalic colored twister seals and stick handles included. Minimum 50 Apples - $6.00 per Apple. Choice of 4 toppings listed below per Apple. Minimum of 5 per combination. Bags, metalic colored twister sealsand stick handles included. - Pick a custom color to drizzle.